Majorca is a destination that most of us associate with sun-drenched beach holidays, but it also home to some beautiful inland towns that have something quite different to offer. One of my favourites is Santa Maria del Cami, which is in the west of the island in the Raiguer district. 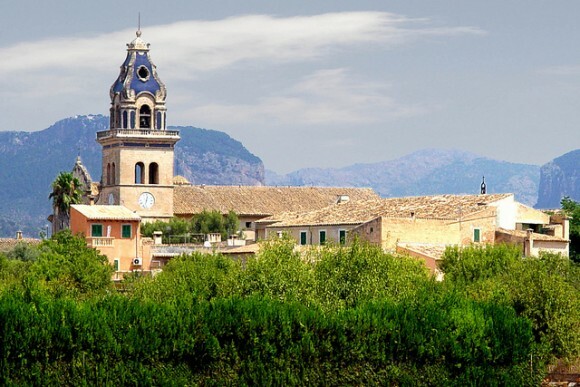 This historic market town can be found on the Palma-Inca railway route, and is nestled near the Tramuntana mountains; in fact, this mountainous backdrop is part of what makes this pretty town so wonderfully scenic. Below, you can learn all about what makes Santa Maria – as it is more commonly referred to as – such a great place to visit, while you can check out places to stay nearby on the Sovereign website. So, what’s the appeal of Santa Maria? While authentic and relatively quiet, this little town has its fair share of claims to fame. For instance, it’s a great wine-producing region, thanks to its fantastically fertile soil – something that means it’s an absolutely perfect destination for wine lovers and foodies. Secondly, it’s also the manufacturing hub of ‘cloth of tongues’, which in the local lingo is called roba de llengues. This cotton fabric is woven into zigzag patterns, and is most typically used to decorate furniture and to make curtains. In addition to having a great reputation for the things it produces, Santa Maria is also known for its pretty scenery. I mentioned above that its backdrop is the Tramuntana mountains, and there are also almond trees and olive groves dotted around the local area. So, wherever you go, you can expect a great view. Santa Maria is a small destination, and that’s really part of its appeal, whether you fancy getting away from the hustle and bustle of Palma on a day trip or basing yourself here for the duration of your break. Despite its size, there’s plenty worth seeing, and for me one of the key highlights is the weekly market. The Santa Maria del Cami Market takes place each Sunday, from approximately 08:00 to roughly 14:00 local time. Come here and you can spend the morning browsing the very best regional produce with the locals. As a quick tip, this is a brilliant place to bite into some deliciously fresh fruit or, if you’re accommodation is self-catering, to purchase a few bits and bobs to try your hand at cooking some local dishes. In terms of buildings, you should take the time to see the 18th-century Baroque church, as well as Casa de la Vila (that’s the town hall to you and me), which dates back to the 1600s. If you’re into hiking, it’s also worth bearing in mind that Santa Maria makes a great base for a trek. On one side of the town is Puig de S’Estrema, while on the other is Puig de Son Segui – both popular hiking destinations. Whatever your individual interests are, I think Santa Maria is the ideal spot for relaxing holidays or day trips that break the usual sun-and-sand mould of your average island getaway. There are some excellent hotels nearby that are perfect for pampering breaks, like Reads Hotel & Spa – an establishment so luxurious that it even boasts its own vineyard and spacious gardens.